Optical diffusers are used to diffuse light and reduce directionality of the beam. 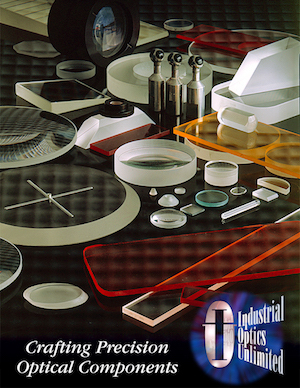 Industrial Optics stocks and custom manufactures ground glass diffusers for a variety of industrial uses. Our ground glass diffusers can be ordered round, square or rectangular and in a range of surface roughness. A fine ground finish provides a higher transmittance while a course ground finish provides less transmittance but a higher amount of diffusion. Optical glass diffusers are commonly made from Borofloat, Soda Lime, BK-7, or Fused Silica. Depending on your application any of the above listed materials you can be provided with a quick turnaround in either a fine ground finish or a course ground finish. Flashed opal diffusers offer better diffusion than optical glass but with a very high scattering loss. Opal diffusers come in standard sheets and can be shaped per your specifications for a quick turnaround. Industrial Optics can support your custom optical diffuser requirements at a competitive savings to standard catalog pricing while providing great quality and exceptional customer service.